Located at 115 MacDougal Street in Greenwich Village, Cafe Wha? is a historic bar known for being the career birthplace of many well-known musicians and comedians. Open since the 1950s, some artists who consider Cafe Wha? a home include Bob Dylan, Jimi Hendrix, Bruce Springsteen, Woody Allen, Lenny Bruce, Bill Crosby and Peter, Paul & Mary, to name a few. Although it’s gone through many changes over the years, you can expect high energy music in an informal atmosphere every night of the week. In 1987, the Cafe Wha? House Band was employed, and are now known throughout the world and regularly feature celebrity guest performers. You can hear them live Wednesday through Sunday, playing everything from Motown to Reggae to Alternative Rock and more. On Monday nights you’ll hear Brazooka, a Brazilian dance band incorporating elements of Jazz and Samba, while Tuesdays are a mix of soul, R&B and Funk with Disfunktion. 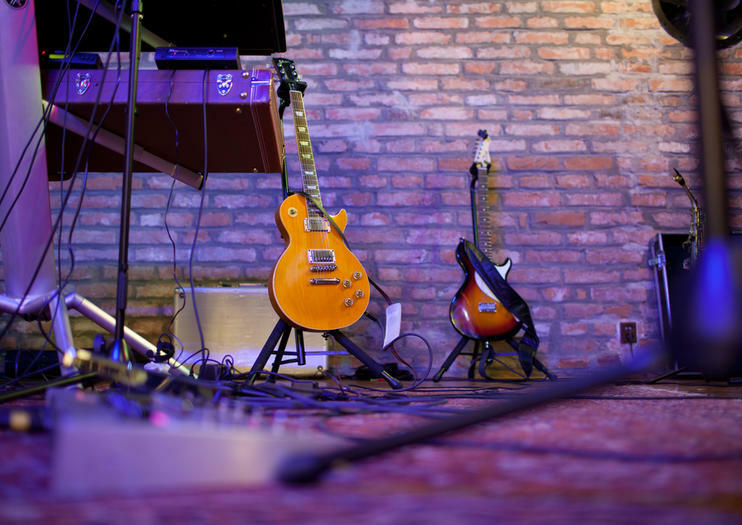 While the house bands play every night at 9:30pm, you can check their calendar for talented guests to go on beforehand. Although the drinks tend to be overpriced and there is usually a cover charge, you will be guaranteed a good show of eclectic music. Moreover, the venue features an extensive bar menu with delicious appetizers, salads, burgers, entrees and desserts. Cafe Wha? Is open daily from 8:30pm, except for Mondays when it opens at 9pm. Reservations are recommended. Cover charges are $10 on Mondays and Tuesdays, $5 on Thursdays, $12 on Fridays, $15 on Saturdays and free to enter on Wednesdays and Sundays. To get to Cafe Wha? by subway take the A, B, C, D, E, F, M to W 4th Street, or the 1, 2 to Christopher Street- Sheridan Square or Houston Street. Besøg lokale haunts og historiske steder på en 2-timers vandretur gennem Greenwich Village og MacDougal Street, og prøv klassiske New York-madvarer på nogle af byens mest elskede caféer og butikker. Få en smag af lokal historie, som du udforsker ved siden af ​​din guide, og følg fodsporene i landsbyens mest berømte beatniks og bohemians. Pause til snacks på en pizzeria og falafel joint, tjek kreative tager på hjemmelavet pasta, så afslut turen med en kødbold og italienske desserter. New York City er en drikkeby. Og denne bibulous tour tager dig til en af ​​tre travle sprængstrømmende dele af byen, hvor du besøger nogle af de bedste barer og pubber i Big Apple. Hit de sande lokale pletter, undgå de turistfælder og broen og tunnelbjælkerne. Fra historiske saloner til celebrity hangouts til klassiske New York dykkestænger, vil denne tour vise dig den virkelige Big Apple drikke scene!